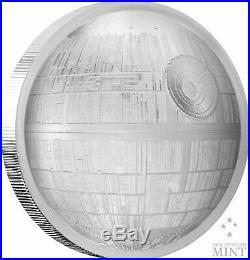 2018 Star Wars - Death Star - Ultra High Relief 2 oz Silver Coin - Coin #5. 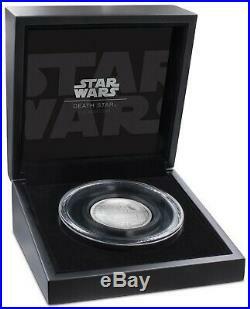 You may wish to check out other Star Wars coins we carry. Foil #1 - 40th Anniversary - Item #372252341668. Foil #2 - The Empire Strikes Back - Item #223129312933. 2 oz - Ultra High Relief. Coin #1 - 2017 Star Wars Darth Vader 2 oz High Relief coin - Item #222746833555. Coin #2 - 2017 Star Wars Han Solo 2 oz High Relief coin - Item #222700918020. Coin #3 - 2018 Star Wars Yoda 2 oz High Relief coin - Item #372222951182. Coin #4 - 2018 Star Wars Stormtroopers 2 oz High Relief coin - Item #223129329620. Star Wars - A New Hope - 5g Silver Notes. 6 note set w/album - Item # 372552309017. 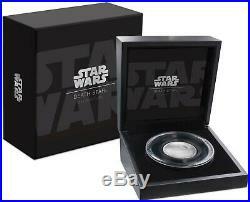 Coin #1 - 2017 Star Wars Ships - YT-1300 Millennium Falcon 1 oz - Item #222412448124. Coin #3 - 2017 Star Wars Ships - T-65 X-WING Fighter 1 oz - Item #222512848987. Coin #2 - The Empire Strikes Back - Poster - Item # 222630210018. Coin #4 - The Phantom Menace - Poster - Item #222889221916. Coin #5 - Episode II Attack of the Clones - Poster - Item #223304306300. Coin #6 - Revenge of the Sith - Poster - Item #372501042962. 2016 Star Wars Classic - Princess Leia Organa - 1 oz - Item #372405657643. 2017 Star Wars Classic - Chewbacca - 1 oz - Item #372386042800. 2017 Star Wars Classic - Obi-Wan Kenobi - 1 oz - Item #222866005680. 2017 Star Wars Classic - C-3PO 1 oz - Item #223302502226. 2018 Star Wars Classic - Jabba the Hutt - Item #222890758260. 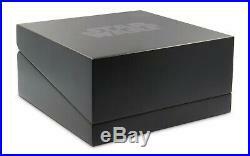 2018 Star Wars Classic - Darth Maul - Item #223058085204. 2018 Star Wars Classic - Emperor Palpatine - Item #372424698688. 2019 Star Wars Classic - Stormtrooper - Item #372486990607. Ultra High Relief 2oz fine silver coin featuring the wise and powerful Jedi Master Yoda. The unique Ultra High Relief effect is achieved by using cutting edge minting techniques which allow the image to rise much higher than the face of the coin. The process not only adds more depth to the coins design, but a deeper, brighter lustre which ensures that every millimetre of the intricate design shines through. It feels more like a tiny sculpture than a standard coin. The coin is nestled in black velvet inside a branded. Coin case angled to display the 3D aesthetic of the coin. The serialised Certificate of Authenticity also sits within the coin case. Themed outer box, this coin makes a truly unique gift. Coin Metal: 999 Fine Silver. Coin Weight: 2 Troy oz. Effigy: Ian Rank-Broadley effigy of Her Majesty Queen Elizabeth II. Yoda was a legendary Jedi Master and stronger than most in his connection with the Force. Small in size but wise and powerful, he trained Jedi for over 800 years, playing integral roles in the Clone Wars, the instruction of Luke Skywalker, and unlocking the path to immortality. 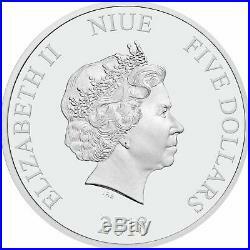 Each Silver Coin comes with an individually numbered certificate of authenticity issued by New Zealand Mint. Questions: Please do not hesitate to ask! The item "2018 Star Wars Death Star Ultra High Relief 2 oz Silver Coin Coin #5" is in sale since Wednesday, February 27, 2019. This item is in the category "Coins & Paper Money\Coins\ World\Australia & Oceania\South Pacific". The seller is "1ozcoins" and is located in Woodbridge, Ontario.